Antronix engineer Richard Gregory is a cut-up in the office, but he is a man with a serious cause. For the last three years he and wife Mary Ann Gregory have given of their time at the Cathedral Kitchen in Camden, New Jersey. 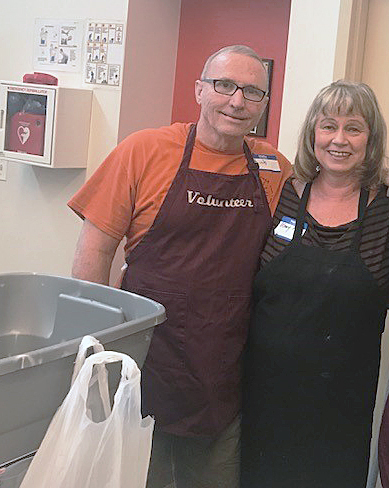 Two Saturdays every month Richard and Mary Ann volunteer to distribute warm food and sandwiches to guests who come in out of dire need. "Some are homeless, some are veterans, some are struggling with drug addiction, some are the working poor," says Richard. "All are in need and all are grateful." Rich, as he is called at work, is passionate about the work he does at the charitable kitchen and often shares touching stories of the people being helped and their impact on him. Antronix has supported Rich's cause and recently donated warm pairs of socks to get guests through the winter months. Family and friends have also supported Rich's cause. Rich and Mary Ann don't live far from Cathedral Kitchen and consider those who come in their neighbors. "There but for the grace of God, go I," is the couple's reason for volunteering. Rich is also regularly touched by guest's gratitude. "They are so appreciative – 'Thank you,' 'God bless you' – for the things most of us take for granted. As long as we have been doing it, it is impossible not to get choked up at least once in a while."